Looking for a better work space and to join a community? Consider a coworking space. Working remotely offers many perks — from avoiding a daily commute and office politics to setting your own schedule — but it can be challenging to stay motivated and connected. Enter office sharing, a concept that has been around for decades but has only recently gained traction. With 3.9 million workers working from home at least half the time , it shouldn’t surprise you that as of 2017, nearly 1.2 million people worked in a co-working space — and that number is bound to grow. Coworking companies are popping up all over the world, just as remote work is becoming more and more common. And even though WeWork is at the forefront of the market, there are dozens of other spaces that may be more fitting — and appealing — to women, especially entrepreneurs. Working from anywhere is exciting, but it can be extremely challenging, especially if you don’t have a home office. As a remote worker, I, personally, am attracted to light-filled coffee shops where I’m surrounded by art, plants, and the energy of others — and it seems I’m not alone. The majority of workers work best in a space that is filled with natural light, varying colors, high ceilings, and yes, plants. At The Riveter ’s West LA location, for example, there are large windows, dozens of plants, and bright white furniture that makes the space feel warm, inviting, and, most importantly, inspiring. They even have an outdoor patio where members can enjoy sunlight and views of the city. The environment in which we work is crucial to our productivity. Everything from the design and the lighting to the temperature and the noise impacts our work. For some, a quiet space is preferred. Others crave a little background noise. It doesn’t matter if you work from a shared desk or a private office, coworking companies provide an ideal, aesthetically pleasing working environment which you may or may not have at home. Office sharing isn’t just for working. When you become a member of a place like SheWorks Collective, you get many additional perks. In addition to the workspace, you get access to networking events, seminars, and best of all, a community of like-minded women working as hard as you to achieve their career aspirations. This is the biggest reason to become a member of an office-sharing space. If you want to learn from others, channel the energy of those working around you, and/or talk to other women in your industry, you should consider an office sharing membership. Considering entrepreneurship? Want to shape your brand or grow your business? When you work from a shared office, you get to use the company’s address as your work address, fax machines and conference rooms. This is ideal if your business is new and you can’t yet afford your own office. Many coworking spaces offer opportunities, sponsorships, and business-to-business mentoring to members. RISE Collaborative , for example, offers a conference for women professionals and a 21-day challenge to women who want to take their business to the next level Hera Hub offers business classes, workshops, talks, book clubs, and community events for women entrepreneurs who want to learn about branding, marketing, consulting, and more. 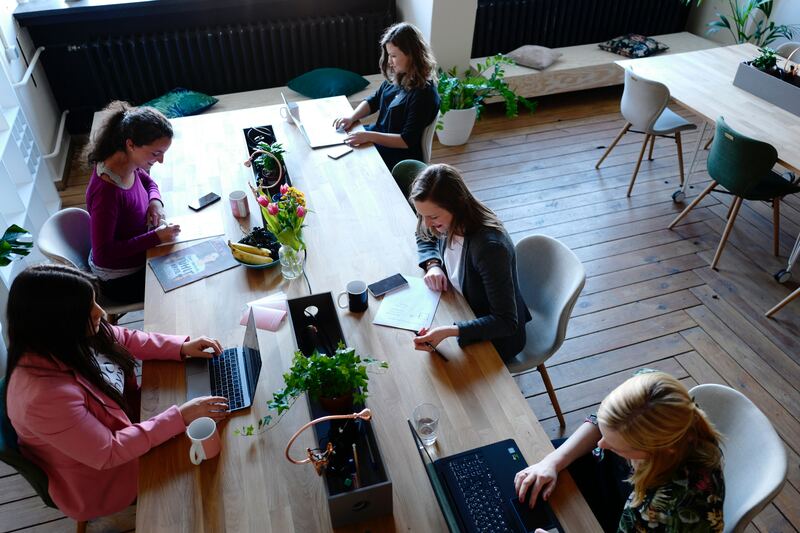 Each women-focused coworking company comes with different perks, but all aim to empower, encourage, and support women in their professional (and often, personal) endeavors. Shecosystem is a community and office space that focuses on self-care and offers an “Energy Exchange” for women working in the wellness space. Whetstone Workgroup and evolveHER offer a childcare option for working mothers so you don’t have to sacrifice your career to raise your kids. At Paper Dolls , you can get access to thousands of business videos, in addition to webinars,complimentary styling, and more. Business isn’t just business anymore, and if you’re doing what you love, it shouldn’t be. A shared office space may or may not be for you, but if you’re eager to reach your career goals and become a stronger leader, it’s worth looking into. Not sure you can afford the monthly fee? Check out and compare the coworking companies near you, before deciding, because there are various membership levels. Many, for instance, offer a “virtual” membership if you want to utilize the business mailing address and attend the events, but not pay for a desk or office. As the number of remote workers continues to grow, more and more coworking spaces are bound to open in the coming months and years — so keep your eyes open for the next one in your area. Sarah is a writer, editor, and storyteller. She earned an MFA in Creative Writing from Lesley University and works as a content writer for a marketing agency, as well as a book publicist, writing instructor, and copywriter. She writes on business, finance, personal advancement, health and wellness, and education.